Pitter-patter, pitter-patter. Just like the other days of winter in Vancouver, my heavy eyes slowly opened as the sound of raindrops crashing on the fragile window echoed in the morning. Appreciating the serene music of nature for few minutes, I sluggishly raised my upper body, stretching my arms and shoulders, and started my day with a loud yawn. Then with dragging feet, I walked to the kitchen and gently grabbed my favourite green cup out of the dish washer. Dribble, dribble, dribble. While pouring in cool fresh water, I stared at the soggy window, thinking of Pajeon all of sudden. Step 1. What is Pajeon? 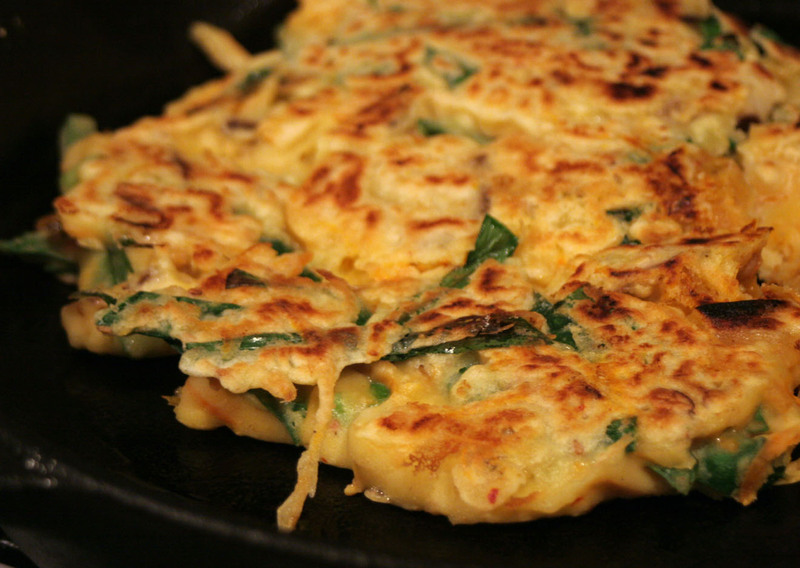 Pajeon is a variety of Korean pancake with chives as its prominent ingredient and is definitely one of dishes that many Koreans seek on rainy days. ‘Why Pajeon?’ a number of you might wonder. As a matter of fact, there are diverse interpretations which surprisingly include scientific explanations. According to the Sound Engineering Professor Bae Myung-jin in Soongshil University, the first theory why Pajeon is very popular in the particular weather is due to the effect of association of sound. “The frequency of raindrops beating against a window and falling on the ground,” he explained “is very similar to the one of sizzling Pajeon on a frying pan, and therefore, people unconsciously remember and look for this food when raining.” The second theory similarly is about our body reaction; on rainy days our body demands more carbohydrate to raise the blood-sugar rate due to high humidity, and as a result, people tend to eat flour-based food which in many Koreans’ case is Pajeon. Eviscerate and wash the squid. Wash Manila clams, mussels, and shrimps in light salt water, and sift them to drain thoroughly. It is very important to make sure they are dry because if don’t, Pajeon will become very soggy. Peel, wash and cut chives into half. Also cut the squid into small pieces. Mix flour and water and in another bowl, break eggs. After greasing the frying pan, spread the mixture thinly and put chives on it. Evenly scatter the seafood and add a bit more of mixture. Turn Pajeon over when one side becomes yellowish.